Series 971 Aerolon ... superior adhesion. The marriage of Tnemec’s time-tested coatings technology with aerogel – known as the world’s best insulating solid material – has resulted in an advanced coatings system called Aerolon, a fluid-applied, thermal insulating coating. 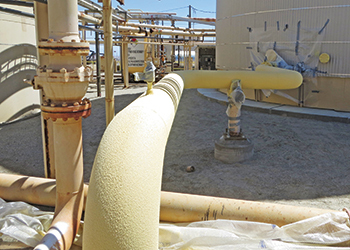 Aerolon offers protection that combats deficiencies found with conventional insulation and can be applied in areas where traditional installations are problematic, says Tnemec. Part of a complete coatings system that also includes specialty primers and topcoats, Series 971 Aerolon Acrylic exhibits superior adhesion and protects infrastructure in several ways. Ideal for coating pipes, valves, tanks, and structural steel, its thermal properties are more efficient than other thermal insulating coatings and it posts similar values to materials such as polyurethane foam and mineral wool, says a spokesman for Saudi-based Gulf Horizon, the official distributor of Tnemec coatings in the GCC. He says when it comes to insulative coatings, manufacturers commonly use ceramic or glass spheres as additives. By adding these small beads to paint resins, manufacturers have created a way to use the trapped gas inside the beads to lower the thermal conductivity of the coating. “One of the problems with ceramic- or glass-infused coatings is that the thermal conductivity is not nearly as efficient as traditional forms of insulation; and if the spheres break during mixing or application, the thermal properties are altered even further. This is an issue that has paved the way for the next generation of thermal insulating coatings – a problem solved by Aerolon,” he says. The thermal performance of aerogel is defined on the nanometer scale, so particle breakage is not a concern. Even if aerogel was to fracture during application, the porosity is maintained since it is at an extremely small scale, according to the Gulf Horizon spokesman. The nanoporous microstructure of each aerogel particle makes it lightweight – 20 times lighter than sand – and its pore size helps reduce energy transfer, he adds. “Because of these factors, aerogel particles produce an ultra-low thermal conductivity of approximately 12 mW/mK (compared to 50-200 mW/mK for ceramic spheres) and have proven to serve a long and consistent life in architectural daylighting, subsea oil and gas pipelines, and insulative blanket products. “Aerolon has the thermal value that rivals conventional insulation such as mineral wool and polyurethane foam. Each coat of Aerolon will have its own R-value that will exceed those of other thermal insulative coatings, while its K-value will remain the same,” the spokesman points out. Series 971 Aerolon Acrylic maintains a K-value of 35 mW/mK, making it more efficient and less conductive than mineral wool, he says. Its R-value is also impressive, at 4.1 per inch, which is twice as efficient as other insulative coatings and comparable to most other forms of insulation. While delivering excellent thermal efficiency, Aerolon also bonds tightly to substrates, forming a durable, water-resistant barrier that limits CUI. This moisture-caused attack is a widespread concern, being one of the most destructive and costly issues impacting industrial infrastructures today, says Tnemec. The key contributor to CUI is moisture ingress into the insulation system. This moisture intrusion that starts the corrosion process is caused by improper installation, material damage, or both. Moisture can accumulate inside the product, and then become trapped between the substrate and insulation, creating corrosion cells that perpetuate the degenerative process. Since the metallic surface is covered by insulation, this process can go unnoticed for years. Wet insulation causes another problem, which results in significant economic impact. Just one coat of Aerolon provides enough protection to well-exceed specified safety standards. Because Aerolon slows heat transfer from one side of a material to the other, it stands as a safeguard from potential hazards – preventing work-related, contact-burn accidents and injuries, he concludes.